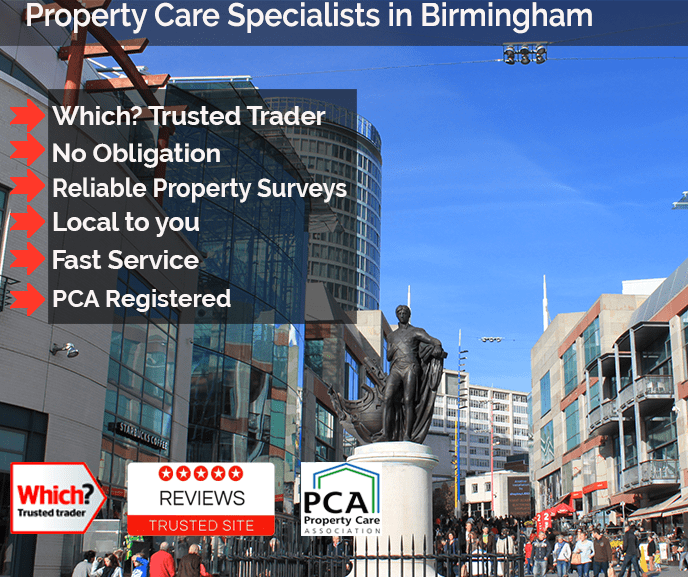 Timberwise is recognised as one of the leading property care specialists in damp proofing, basement waterproofing, dry rot and woodworm treatment in the Birmingham area. Birmingham, Bromsgrove, Burntwood, Cannock, Coventry, Dudley, Kenilworth, Lichfield, Royal Leamington Spa, Redditch, Rugby, Solihull, Sutton Coldfield, Tamworth, Walsall, Warwick, West Bromwich and Wolverhampton to name but a few places! At Timberwise we have fully trained surveyors and technicians that are local to Birmingham and the surrounding area. Our Birmingham property preservation experts care for both residential and commercial properties. Our team makes sure that any problems that do exist within your property are resolved with the minimum amount of disruption. Our friendly local team are experts and are on hand to advise you on the following aspects of property care so don’t hesitate to call Timberwise on 0121 412 9315 to speak to our team. Our Birmingham damp proofing surveyors are highly trained professionals and can identify damp problems throughout a property. You should never leave a damp problem untreated – If there is untreated damp present on walls or floors this may lead to severe structural damage in the future. It is important to identify damp issues as soon as possible so any future damage can be prevented. All projects are different and the best way to ensure your property remains safe is to arrange a damp survey with one of our damp proofing experts. For the treatment of dry rot, our highly trained property experts in Birmingham must first identify and solve any damp issues prior to any dry rot treatments been applied. Dry rot can only occur when the timber has a moisture content in excess of 20%. Dry rot can affect timbers in both domestic and commercial properties and is a widespread concern across the United Kingdom. The reason for the concerns is that this wood destroying fungi can ultimately destroy timbers that give the building structure strength and integrity. For woodworm issues, our highly experienced team must first identify what type of wood boring insect is affecting the property. An effective and efficient water-based treatment can then be used on the timbers. The technician sprays insecticide onto the wood. After the woodworm treatment has been absorbed into the wood any emerging woodworm are killed as they exit the wood. If you want to find out more information about services and how we treat them please click here. Our teams are fully qualified and trained to ensure that all our work carried out is met at the highest standards throughout all the projects. We regularly carry out treatments for, damp proofing, woodworm, dry rot amongst other services throughout the Midlands. If damp, rot or waterproofing problems are affecting your property then Timberwise are here to help solve these issues with ease. You can contact our local Birmingham team on 0121 412 9315 or request a survey online by filling out the form at the top of the page.